Inter Milan should be basking in the glory of a record-breaking season but instead the manner of Jose Mourinho's departure has left a nasty taste in the mouth. A first Champions League triumph since 1965 and an unprecedented Italian treble have been overshadowed by Mourinho's unashamed desire to join Real Madrid and his verbal volleys against what he saw as the cynical Italian game. The outspoken Portuguese all but announced he was leaving for Real when Inter were still celebrating on the pitch after their 2-0 European Cup final win over Bayern Munich last Saturday. Winning the most-coveted of trophies at Real's Santiago Bernabeu stadium only served to increase the drama which envelopes the brash former Chelsea coach, leading fans around the world to love him and hate him in equal measure. 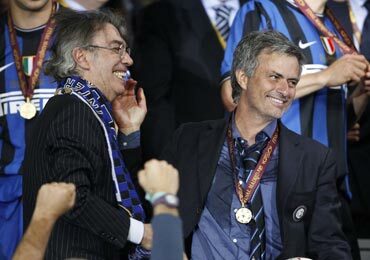 Inter president Massimo Moratti, who on Friday agreed a compensation deal to allow Mourinho to join Real, had very little time to enjoy his team's stunning achievements. "Certainly his timing was not great," Moratti, who sees England coach Fabio Capello and Fulham boss Roy Hodgson as potential replacements, told reporters. "Both for him and the fans, he could have opted for a course of action a little different," he added. 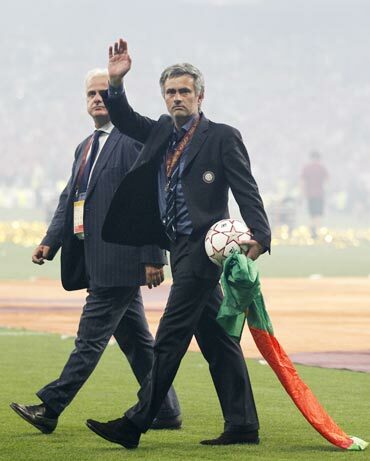 Mourinho cried when Inter wrapped up a fifth straight Serie A title on the final day of the season against Siena and the waterworks from the usually cool coach were also on full power after the Bayern game. 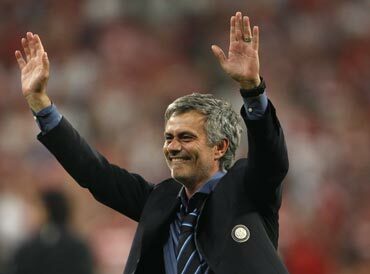 He has spoken often of his attachment to the Inter team and fans, despite his hatred of the Italian media and soccer establishment, but his swift departure was not a surprise given he did the same thing when leaving Porto for Chelsea in 2004 following their European Cup success. Despite not managing to fully appreciate his club's moment of glory because of Mourinho, Moratti would not have swapped his coach for the world given what they have achieved. The club president knew he was signing a livewire when Mourinho rolled up two years ago. "He worked hard, seriously, with all his soul and he won so much. This situation does not ruin at all my esteem and friendliness towards him as a person. The door is always open," Moratti added.